During the film's final scenes in London, the nine realms began to converge and the audience get a glimpse through a number of circular portals in to several of them - one of which appears to be Muspelheim, the realm of fire. Inside the fire realm, amidst the backdrop of solid flames, there is a distinctive shape moving around - that shape would appear to be Surtur. 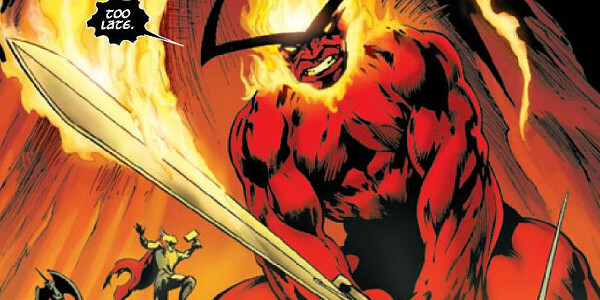 Surtur is the fire demon who attempts to bring upon Ragnarök - the Norse version of the apocalypse and a being so powerful that, in the comics, he is capable of rivalling Odin and is far too powerful for Thor to defeat alone. It is no surprise, therefore, that Surtur and the Ragnarök arc is one of the stories widely believed to be a strong contender for Thor 3 (and he's a villain that I've been championing for some time in previous articles, so I am very excited about this potential movie arc).